The Saab 37 Viggen (English: Thunderbolt) was a Swedish single-seat, single-engine, short-medium range fighter and attack aircraft, manufactured between 1970 and 1990. Several variants were produced to perform the roles of all-weather fighter-interceptor, ground attack and photo-reconnaissance, as well as a two-seat trainer. The Viggen was initially developed as a replacement for the Saab 32 Lansen in the attack role and later the Saab 35 Draken as a fighter. The first studies were carried out between 1952 and 1957 involving the Finnish aircraft designer Aarne Lakomaa. Several different concepts were studied involving both single- and twin engines and also with separate lift engines, both simple and double delta wings and also with canard wings. Even VTOL designs were considered. To meet these design goals, Saab selected a radical configuration: a conventional delta wing with small, high-set canard wings. Canards have since become common in fighter aircraft, notably with the Eurofighter Typhoon, Dassault Rafale, Saab JAS 39 Gripen and the IAI Kfir, but mainly for agility reasons rather than STOL capabilities. The final proposal was presented and accepted on 28 September 1962. Construction started in 1964, with a first prototype maiden flight on 8 February 1967. In 1960, the U.S. National Security Council, led by President Eisenhower, formulated a military security guarantee for Sweden. The U.S. promised to help the Swedish militarily in the event of a Soviet attack against Sweden; both countries signed a military-technology agreement. 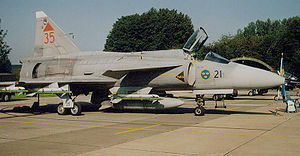 In what was known as the "37-annex", Sweden was allowed access to advanced U.S. aeronautical technology which made it possible to design and produce the Saab 37 Viggen much faster and cheaper than would otherwise have been possible. According to the doctoral research of Nils Bruzelius at the Swedish National Defence College, the reason for this officially unexplained U.S. support was the need to protect U.S. Polaris submarines deployed just outside the Swedish west coast against the threat of Soviet anti-submarine aircraft. Saab had originally wanted the Pratt & Whitney TF30 as the Viggen's powerplant. Since the engine design had not been completed in 1962 when the airframe vs. engine design size needed to be frozen, the JT8D was chosen as the basis for modification instead. The RM8 became the second operational afterburning turbofan in the world, and also the first equipped with a thrust reverser. It had a bypass ratio of around 1.07:1 in the RM8A, which reduced to 0.97:1 in the RM8B. The AJ, SF, SH and SK 37 models of the Viggen had the first version of the RM8A engine with uprated internal components from the JT8D that it was based on. Thrust was 65.6 kN dry and 115.6 kN with afterburner. For the JA 37, the RM8A was modified to an 8B by replacing one LP compressor stage with a fan stage and improved combustor, turbine and afterburner. Thrust is 72.1 kN dry and 125.0 kN with afterburner. The engine was started via a small gas turbine, itself started by an electric motor. Standby power and cooling air for onboard avionics were supplied via an external cart. An internal battery permitted start of the starter turbine and main engine in absence of the standby power cart. With the performance requirements to a large extent dictating the choice of the engine, the airframe turned out to be quite bulky compared to contemporary slimmer designs with turbojet engines. The first prototypes had a straight midsection fuselage that was later improved with a "hump" on the dorsal spine for reduced drag according to the area rule. The wing had the shape of a double delta with a dogtooth added to improve longitudinal stability when carrying external stores. Each dogtooth was also used as a fairing for a radar warning receiver (RWR) antenna. A consequence of a tailless delta design, such as in the Viggen, is that the elevons, which replace more conventional control surfaces, operate with a small effective moment arm; their use adds substantial weight to the aircraft at takeoff and landing. Hinged leading edge surfaces can help counteract this, but an even more effective tool is the canard. The canards were positioned behind the inlets and placed slightly higher than the main wing, but were not movable as control surfaces (however, they were equipped with flaps). The purpose of the canard wings were to act as vortex generators for the main wing and therefore provide more lift. An added benefit was that they also improved roll stability in the transonic region around Mach 0.9. The canard flaps were deployed in conjunction with the landing gear to provide even more lift for takeoff and landing. To withstand the stresses of no-flare landings, Saab made extensive use of titanium in the construction of the Viggen, especially in the fuselage, and incorporated an unusual arrangement for the main landing gear, in which the two wheels on each leg were placed in tandem. While such a layout is common in airliners and cargo aircraft, it is rare in fighters, but allows stowage in a thinner wing. The tall single vertical stabilizer (45 degrees sweepback on the leading edge) was foldable to make it easier to store in hangars. After prototype testing of the SK variant, reduced longitudinal stability was discovered. To correct this, the vertical stabilizer was extended 10 cm (4 in) and the pitot tube was moved from the top of the fin leading edge to about midpoint where a sawtooth was also incorporated. The JA model later used the same improvements. The six tanks in the fuselage and wings held approximately 5,000 litres of fuel with an additional 1,500 litres in an external drop tank. The specific fuel consumption was only 0.63 for cruise speeds (fuel consumption was rated 18 mg/Ns dry and 71 with afterburner). The Viggen's consumption was around 15 kg/sec at maximum afterburner, which meant that the internal fuel was exhausted in just seven minutes due to the relative inefficiency of the turbofan over a turbojet at full afterburner. Performance comparisons with other aircraft from the same age are however slightly difficult, since no other fighter or attack aircraft aside from the Harrier and Yak-38 were designed for STOL or VTOL capability. In the early 1960s, it was decided that the Viggen should be a single seat aircraft. A digital central computer and a head-up display replaced the human navigator. This computer, called CK 37 (centralkalkylator 37), was the world's first airborne computer to use integrated circuits. It utilized the STRIL 60 system to be linked with the Swedish defence systems. The main sensor was an Ericsson PS 37 X-band monopulse radar with several functions: air-to-ground and air-to-air telemetry and cartography. A Honeywell radar altimeter with transmitter and receiver in the canard wings was used to assist low altitude flight. A Decca Type 72 doppler navigation radar and a series of other electronic sub-systems were also provided. A novel landing-aid device, the TILS (Tactical Instrument Landing System), made by Cutler-Hammer AIL, was used to improve landing accuracy down to 30 m from the threshold on the short highway airbase system. ECM consisted of a Satt Elektronik radar warning receiver system in the wings and the tail, an optional Ericsson Erijammer pod and BOZ-100 chaff/flare pod. In total, the electronics weighed 600 kg which was a substantial amount for a single-engine, late 1960s fighter. The SK 37 trainer omitted the radar and CK 37 navigational computer, navigating only using the Decca system and later DME. The radar warning receiver electronics were also removed. Initially, only a single reconnaissance (S) variant was considered, but fitting cameras as well as a radar proved to be impossible. The SH 37 maritime strike and reconnaissance variant was very similar to the AJ 37 and differed mainly in a maritime optimized PS 371/A radar with longer range and cockpit camera and tape recorder for mission analysis. "Red Baron" and LOROP camera pods were usually carried on the fuselage pylons. The centerline fuel tank was converted for a short period of time to a camera pod with two Recon/Optical CA-200 1676 mm cameras. In addition to the reconnaissance equipment, the SH 37 could also use all weapons for the AJ 37. For the photographic SF version, the radar in the nose was omitted in favour of one SKa 24 57 mm, three SKa 24C 120 mm and two SKa 31 600 mm photographic cameras as well as one VKa 702 Infrared linescan camera. The "Red Baron" and LOROP camera pods could also be carried on the fuselage pylons. The avionics suite of the JA was a major improvement over the other variants designed a decade earlier. The onboard computer was a Singer-Kearfott SKC-2037 built under license by Saab as CD 107, a Garrett AiResearch LD-5 air data computer (also used in the F-14 Tomcat), a Saab-Honeywell SA07 automatic flight control systems (which was the first digital variant to enter production) and a KTL-70L inertial navigation system. In the cockpit, several dial-indicator instruments were replaced by two CRT displays; one target indicator MI (sw: Mx�lIndikator) in the center and one tactical moving- and rotating map indicator TI (sw: Taktisk Indikator) to the right while the head-up display SI (sw: SiktlinjesIndikator - line-of-sight indicator) was retained. The radar on the JA 37 was upgraded to a multi-mode, pulse-Doppler Ericsson PS 46/A unit more optimized for the fighter/interceptor role. It sported lookdown/shootdown capability, range up to 48 km (30 mi), continuous-wave illumination for the Skyflash missiles as well as the ability to track two targets while scanning. The MTBF was reported as 100 hours, a very high reliability level for that generation of avionics systems. In 1992, an upgrade program of some of the AJ/SF/SH (with least hours on the airframe) to AJS/AJSF/AJSH was initiated because of delays of the new JAS 39 Gripen. The modifications were not too extensive and consisted to the major part of a new Ericsson computer processor system, MIL-STD-1553B databus and MIL-STD-1760 stores interface system to carry the Rb 15F anti-ship missile and DWS 39 Mjx�lner submunitions dispenser. An upgraded radar warning receiver system with recording capability as well as a Mission planning system via a portable cartridge were also implemented. The original PS 37/A radar from the AJ 37 was upgraded to the PS 371/A (from the SH 37) allowing the new AJS 37 to perform radar reconnaissance missions. No airframe- and very minor cockpit modifications were made. The JA 37 was continuously upgraded throughout its lifetime. In 1985, the "fighter link" went into service, permitting encrypted data communication between four fighters and ground radar based fighter command. This enabled one fighter to "paint" an airborne enemy with guidance radar for the Skyflash missiles of the three other fighters in a group while they had their search and guidance radar switched off. This system was operational ten years before any other country's. The autopilot was also slaved to the radar control to obtain better precision firing the cannon. In 1990, the PS 46/A was upgraded with higher resistance to jamming and the ability to track several targets at the same time. In 1993, the ability to generate virtual targets in the radar reduced the cost of flying aggressors for training. Between 1992 and 1997, a major avionics upgrade program to the JA was implemented, given the new designation JA 37D. 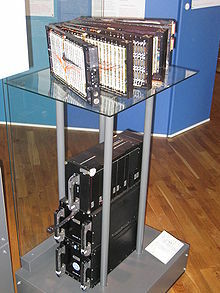 It consisted of an Ericsson CD207 mission computer, an ANP-37 stores management computer, linked via dual MIL-STD-1553B databuses permitting use of the Rb 99 AMRAAM. In the cockpit, a TI 327 color tactical moving-map display (originally intended for the Gripen) and a Synthetic Attitude Heading Reference System were installed. The ECM and ECCM suite were enhanced with improved electronics, upgraded radar warning receivers, a new Ericsson U95 jammer pod as well as the ability to carry BOY-401 chaff/flare dispensers on a separate location from the weapon pylons. Between 1998 and 2000, the conversion of ten Sk 37 trainers to Sk 37E electronic aggressors was completed. The fairly substantial upgrade package consisted of the nose-radome mounted G24 jammer inherited from the decommissioned J 32E Lansen, U22/A jammer- and KB chaff/flare pods and radar warning receivers from the AJS 37 and a new U95 jammer pod all linked together with the MIL-STD-1553B databus. The rear cockpit for the Electronic Warfare Officer was improved with new displays and controls while retaining the ability to convert back to the original flight training role. The displays in the original cockpit were all of the traditional analogue/mechanical type with the exception of an electronic HUD which could be used as a precision landing aid. Original layout drawings show the forward display area dominated by a central large Horizontal Situation Indicator (HSI) with its integral altitude warning light. To the left were the attitude indicator, altimeter and airspeed indicator / MACH displays and to the right, twelve smaller displays including a clock, g-meter, destination indicator, standby instruments, R.P.M. indicator, distance indicator, EPR indicator and fuel indicator. The ejection seat was the Raketstol 37 (literally; Rocket chair 37) and was the last Saab designed seat in service. A derivative of the Saab 105 trainer seat, the seat was optimized for low altitude, high speed ejections. Low speed capability was limited to speeds above 75 km/h (47 mph) on the runway. The seat was angled back by 19 degrees to help counter g-forces in flight. The pilot flew with a centre stick and left side throttle. The hands-on-throttle-and-stick HOTAS controls included trim, autopilot disengage, event marker and trigger (on the stick) and ECM switch and missile seeker un-cage (on the throttle). Adjacent to the throttle was a separate radar joystick. There were dedicated warning caption panels each side of the pilot's legs. On the right console panel were numerous dedicated controls and indicators, including weapons and missile controls, nav panel, oxygen on/off, windshield de-fogging, IFF control, lighting controls. Situated on the left console panel were radar controls, canopy handle, landing gear handle, radio controls and the cabin pressure indicator. A weapons load of up to 7,000 kg could be accommodated on seven hardpoints; one centerline pylon, two fuselage pylons, two inner and two outer wing pylons. The centerline pylon was the only wet pylon and was usually occupied by an external fuel tank. The outboard wing pylons were never used in peacetime since aerodynamic flutter loads would structurally fatigue the wing. The AJ 37 was designed to carry two RB 04E anti-ship missiles on the inboard wing pylons with an optional third missile on the centerline pylon. An optional load consisted of two RB 05A air-to-surface missiles on the fuselage pylons. The RB 05A was later replaced by Rb 75 TV-guided missiles. In a ground-attack role, a combination of unguided 135 mm rockets in sextuple pods and 120 kg fragmentation bombs on quadruple-mounts could be used. Self-defense was provided with either ECM or 30 mm ADEN cannon pods with 150 rounds of ammunition on the inboard wing pylons. For the secondary air-to-air role and self defence, the Rb 28 IR-missile was initially selected, but was never used due to poor performance. This left the outboard wing pylons unutilised as the Rb 28 was the only missile integrated there up until the AJS modernisation. Instead, Rb 24/Rb 24J were used on the fuselage pylons and inboard wing pylons or in combination with optional 30 mm underwing ADEN cannon pods. AJ 37 was under consideration as a carrier of both nuclear and chemical weapons, although no nuclear or chemical weapons were adopted by Sweden. The SH 37 was capable of carrying the same configuration of weapons as the AJ 37. However, since it was only used in the maritime role, only the RB 04E in combination with Rb 24/Rb 24J for self defense were employed. The chaff and jammer-pods was the most commonly used load. Both the SF and SK variants lacked the radar and could not carry the guided air-to-surface missiles as the AJ and SH. The SF could carry Rb 24/Rb 24J for self defense though. The unguided cannon and rocket pods were also an option. With the introduction of the JA 37 in 1979 came the Ericsson PS 46/A radar capable of guiding the two semi-active radar homing Rb 71 missiles on the fuselage pylons simultaneously in combination with Rb 24J/Rb 24J air-to-air missiles. Unlike the strike variant a KCA 30mm Oerlikon internal cannon was carried as well as 126 rounds, in a conformal pod under the fuselage. The firing rate was selectable at 22 or 11 rounds. The KCA cannon fired 50% heavier shells at higher velocity than the older ADENs, giving a much higher kinetic energy. This, in conjunction with the fire control system, allowed air-to-air engagements at longer range than other fighters. The unguided cannon and rocket pods were available in the secondary ground-attack role. The centerline pylon was almost exclusively carried a semi-permanent fuel tank, which was jettisonable in the event of a dogfight. In 1987, the more advanced all-aspect Rb 74 air-to-air missile was introduced for the JA 37. With the major upgrade of the JA to JA 37D in 1997 came the ability to carry four Rb 99 on the fuselage- and inner wing pylons. In addition, a U95 ECM pod could now be carried under the right wing in place of an AMRAAM as well as chaff and flare dispensers on a pair of hitherto unused pylons just behind the main landing gear on each wing. With the extensive electronics upgrade of the old AJ/SF/SH in 1992 came the ability to carry the new Rb 74 on all weapons pylons. The AJS and AJSH also received the Rb 15F anti-ship missile and BK 90 stand-off cluster bomb originally intended for the delayed JAS 39 Gripen. Picture - A Viggen at the Swedish air force museum. One hundred and ten of the original, ground-attack optimized variant, AJ 37 were built, with the first operational squadron established in 1972 at F 7 Sx�tenx�s. A two-seat trainer was not initially planned since it was considered that new pilots could get enough experience with delta-winged aircraft on the SK 35 Draken trainer. Eventually, however, 18 SK 37 two-seat trainers were ordered and delivered in 1973. To make room for the second cockpit, one fuel tank and some avionics were removed. The radar was also omitted limiting the weapons load to gun pods and unguided rockets. Picture - Special red version Viggen that can also be seen at the Swedish air force museum in Linkx�ping. A total of 26 of the SH 37 maritime reconnaissance and strike variant were built in 1974, replacing the S 32C Lansen. Although fitted with radar and weaponry, the SH 37 Viggen could also undertake photographic missions with its single long-range camera, while external pods could carry a photographic day-set, a "Red Baron" IR set, an ELINT set, and AQ series ECM (made by SATT). A further 26 of the SF 37 reconnaissance variant were also delivered to replace the S 35 Draken in 1975. These were recognizable by having an elongated nose, equipped with six cameras and a VKa 702 infrared linescanner for night reconnaissance. Also, the "Red Baron" pod, with three IR cameras was widely used, as well as an ELINT set. Although the Viggen was offered for sale worldwide, and regarded as a very competent aircraft, no export sales occurred. Reasons to explain Saab's failure to sell a competitively priced, highly advanced and well-respected aircraft include the Swedish government's relatively strict controls on arms exports to undemocratic countries, potential customers' doubts about continuity of support and supply of spare parts in the event of a conflict disapproved of by Sweden, and strong diplomatic pressure of larger nations. The United States blocked an export of Viggens to India in 1978 by not issuing an export license for the RM8/JT8D engine, forcing India to choose the SEPECAT Jaguar instead. 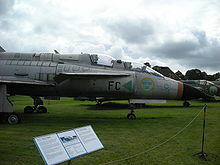 The Viggen saw initial service in natural metal, later receiving an extremely elaborate disruptive camouflage scheme for the AJ/SF/SH/SK variants and the first 27 JA aircraft. The 28th JA was painted in a gray tone that turned out too close to white. All latter JA aircraft were painted in a darker light/dark gray, appropriate for a high altitude fighter. The final Viggen production variant was the JA 37 interceptor entering service in 1980. The last of 149 JA 37s was delivered in 1990. Differences from the previous models included an improved and more powerful RM8B engine, a new PS 46/A interception radar, new computers, HUD, ECM and some other subsystems. Swedish JA 37 fighter pilots have managed to lock their missiles on the SR-71 Blackbird, using the predictable flight patterns of SR-71 routine flights over the Baltic Sea. Unusually for a 1970s fighter, three multi-purpose CRT display screens were fitted within the cockpit, in a system called AP-12, that also included a new model of HUD. The new radar was compatible with the Skyflash medium-range missiles, for the first time in a Swedish fighter. Two Skyflash missiles could be carried under the wings on hardpoints, as well as four Sidewinder J or L models. Another improvement was the addition of an Oerlikon KCA 30 mm cannon mounted internally, with 126 rounds of 360 g ammunition. The structural strength was also improved, especially for the multi-sparred wings (initially Viggens had a high loss rate, with 21 aircraft lost in the early years). Various upgrades have been performed over the years, mainly to cockpit equipment, weapons and sensor fit. Between 1998 and 2000, ten SK 37 trainers were converted to SK 37E electronic warfare trainers to replace the aging J 32E Lansen. The Viggen has been phased out in favour of the advanced later generation JAS 39 Gripen with the last front line Viggen retired from the Swedish Air Force in November 2005. A few aircraft were kept flying for electronic warfare training against JAS 39 at F 17M in Linkx�ping. The last Viggen flight took place in June 2007. AJ 37 Primarily a single-seat ground-attack fighter aircraft, with a secondary fighter role. First delivery in 1971, serial numbers 37001-37108. RM 8A powerplant. PS 37A radar. Partially decommissioned in 1998, some upgraded to AJS 37. SK 37 Two-seat trainer aircraft, first delivery in 1973, serial numbers 37801-37817. No radar. Decommissioned in 2003, some airframes converted to SK 37E. SF 37 Single-seat photographic reconnaissance aircraft, first delivery in 1975, radar replaced with four cameras, serial numbers 37950-37977. Partially decommissioned in 1998, some upgraded to AJSF 37. SH 37 Single-seat maritime reconnaissance and strike aircraft, first delivery in 1975, PS-371A radar, serial numbers 37901-37927. Partially decommissioned in 1998, some upgraded to AJSH 37. Saab 37E Eurofighter Proposed NATO replacement of F-104 Starfighter in 1975, none built. Saab 37X Proposed export version, none built. JA 37 Primarily a single-seat all-weather interceptor fighter, with a secondary attack role. First delivery in 1979, serial numbers 37301-37449. A 10 cm (4 in) stretch in the shape of a wedge wider at the bottom than on the top of AJ 37 fuselage between canard and main wing. PS 46A LD/SD radar. Partially decommissioned in 1998, some upgraded to JA 37D. AJS/AJSF/AJSH 37 Upgrade of some AJ/SF/SH 37 between 1993 and 1998. Avionics and software upgrade. Decommissioned in 2005. JA 37C Upgrade of older JA 37, avionics and software upgrade. JA 37D Upgrade of older JA 37 between 1993 and 1998, avionics and software upgrade. JA 37Di Upgrade of older JA 37, avionics and software upgrade. SK 37E Electronic warfare trainer, conversion of ten obsolete SK 37 trainers from 1998 to 2000, serial numbers 37807-37811 & 37813-37817, decommissioned in 2007. Coombes, L.F.E. Control in the Sky - The Evolution and History of the Aircraft Cockpit. Barnsley, South Yorkshire, UK: Pen and Sword Books Ltd./Leo Cooper Ltd., 2005. ISBN 1-84415-148-4. Donald, David and Jon Lake, eds. Encyclopedia of World Military Aircraft (Single Volume Edition). London: Aerospace Publishing, 1996. ISBN 1-874023-95-6. Gunston, Bill and Mike Spick. Modern Air Combat: The Aircraft, Tactics and Weapons Employed in Aerial Warfare Today. New York: Crescent Books, 1983. ISBN 0-51741-265-9. Gunston, Bill and Mike Spick. Moderne Kampfflugzeuge (in German). Tyskland, Germany: Stocker-Schmid AG Verlag, 2001, p. 148. ISBN 3-7276-7062-2. Jackson, Paul. "Saab 37 Viggen". World Air Power Journal, Volume 13, Summer 1993, London: Aerospace Publishing, pp. 46-89. ISBN 1-874023-17-4. Nativi, Andrea. "Viggen, Il Caccia Venuto dal Freddo." (in Italian) RID magazine, June 1993, pp. 20-36. Taylor, J.W.R. "SAAB 37 Viggen (Thunderbolt)". Jane's All the World's Aircraft 1980-81. London: Jane's Publishing Company Limited, 1981. ISBN 0-531-03953-6. Taylor, John W.R., ed. Jane's All the World's Aircraft, 1988-1989. London: Jane's Information Group, 1988. ISBN 0-7106-0867-5. Williams, Antony G. and Dr. Emmanuel Gustin. Flying Guns, The Modern Era. Marlborough, Wiltshire, UK: The Crowood Press, 2004. ISBN 1-86126-655-3. Winchester, Jim, ed. "Saab AJ/SF/SH Viggen". Military Aircraft of the Cold War (The Aviation Factfile). London: Grange Books plc, 2006. ISBN 1-84013-929-3.